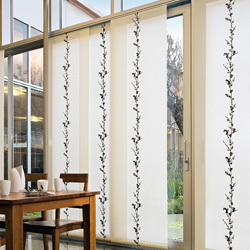 The Aptimus blind also known as the triple shade or as the silhouette blind gives the customer the choice of a sheer as well as a dim-out option in a single blind. These are available in gentle shades of whites and beiges as well as many colours & styles. The Cassette Roller blind system is essentially a roller blind with all its sides enveloped in a frame to block 100% of light from entering through that particular opening. This system can also be used incase the bottom bar needs to be guided or kept locked into the side-channels (when it is used at an angle or slope for instance). It is advisable to use Blackout fabrics for this system, although Translucent and Dim-out fabrics can also be used. This option is great for a number of different situations such as large commercial offices as it allows for two or three blinds (depending on the overall blind size) to be controlled by one drive system (Chain Clutch or Tubular Motor). 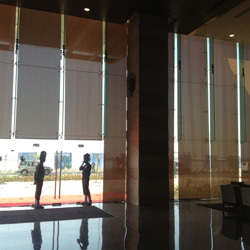 The blinds can be installed in a straight line or at an angle. Somfy Fabric Tension System (FTS) provides solutions for shading large areas, either horizontally or on a gradient. The FTS is an ideal solution for horizontal or sloped glass panels and even vertical ones where the fabric needs to be constantly under tension. Applications include greenhouses, skylights, domes as well as terraces in restaurants, hotels and shopping centers. This system uses two motors, one on either side of the fabric, and is controlled electronically to allow adjustment of the fabric tension. Thanks to FTS, the fabric flatly distributes alongside the glass or system framework. 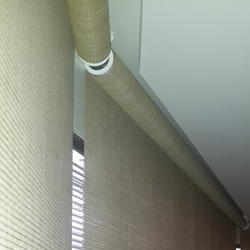 The honeycomb blind concept is that of two pleated blinds that have been fused together to make a single blind in a cellular format which insures good insulation properties for the blind. 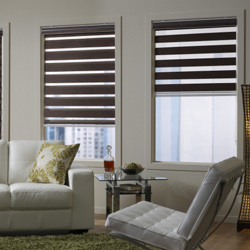 These blinds also occupy one of the LEAST stacking space as compared to any other blind system. Galeecha provides full control for your Interior Window Coverings to Automate the Blinds and Curtains. Your motorised systems can function as per your command to the preset conditions set by you through our remotes. You could also operate them via a switch or over a third party home automation system. Additionally a sun sensor can be connected to the blinds for hassle-free opening and closing of blinds and curtains to the direction of the sun. 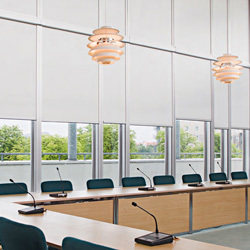 The Panel blinds are panels of fabric having horizontal (left-right, side-ways) movement. They are like a series of lowered roller blinds having the movement of curtains. The fabrics are treated to resist stains and have an anti-static finish to minimize dust build-up. These are available in a wide range of fabrics and designs ranging from See-Through, Translucent and Blackouts. The concept of pleated blinds has been widely misrepresented in the blinds' industry that over a period of time, the pleated blinds flatten at the upper part of the blind due to being stretched by gravity of its own weight. Galeecha ensures that this stretching does not occur and the pleats remain the same throughout the drop of the blind. 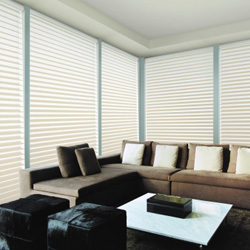 These blinds also occupy the LEAST stacking space as compared to any other blind. 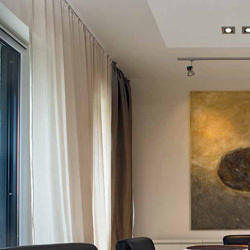 Roller blinds provide sheer elegance to the interiors spaces and enhance the decor of the interiors. A very wide choice of fabrics, from decorative to screen and specialized applications, makes the choice rather easy and convenient. 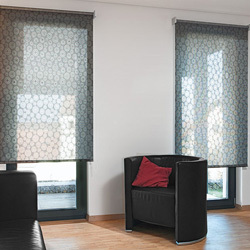 For instance if you're looking for a roller blind that provides ample solar protection and at the same time let's you view the outside, you have a choice from a large collection of screen fabrics. On the other hand if you desire maximum solar control and room darkening effect, select from our range of blackout and dim-out fabrics. These fabrics are technical fabrics and are ideal for all areas. These fabrics reduce light, heat and offer protection for furniture & flooring from sun effects like fading and bleaching. These fabrics are ideal when natural light needs to be regulated and they also offer limited visibility. All our blinds come with varying efficiencies in reducing the heat as well as stopping direct sunlight to help protect furniture and remove glare from TV & computer screens. These fabrics are ideal for bedrooms and home cinemas as they block out 100% light and reduce heat gain. Blockout fabrics give you privacy and protect furniture and flooring from sun effects like fading and bleaching. These fabrics are decorative in nature and are ideal for living areas. 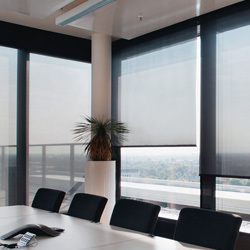 These fabrics reduce light, offer heat reduction and glare control while maintaining the view. Ideal for all areas, these fabrics reduce light, reduce heat, offer protection for furniture and flooring from sun effects like fading and bleaching. These fabrics are ideal when limited light is required and clear visibility is not needed. Our Roman shades are subtly textured with understated folds to compliment any room décor. Stylize your home from an array of fabrics and style. Handpick your favorite colour with varying levels of light control, including blackout versions for total privacy. 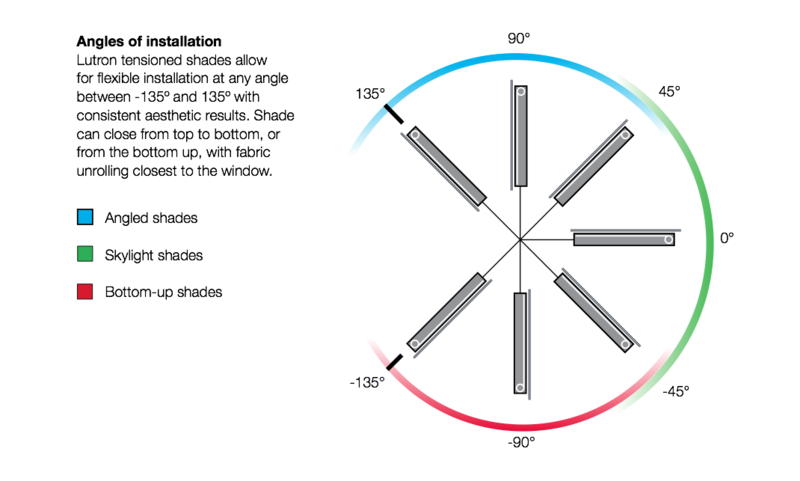 Lutron® tensioned shade allows flexible installation of the roller system at any angle. Shade can close from top to bottom or from the bottom up. 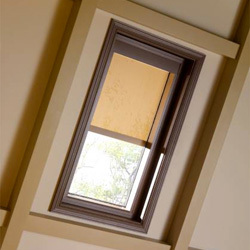 The fabric is kept taut and parallel to the skylights or the angled windows regardless of slope. The fascia frame eliminates gaps around the fabric. The cable guides are also concealed, giving an unobstructed clear view when open. Galeecha offers a large choice of colours, finishes and textures. Choose from a vast range of colours that best suits your interiors or select a shining metallic texture or finish that goes well with your futuristic interior decor. If you are an outdoor lover and don't want to compromise with the outside view and yet want adequate solar protection, you could choose perforated blinds. You could also make your own colour combinations. A single colour right from valance to slats to cords or a dual colour combination for slats with a highlight or horizontal stripes or may be multi-colour combination of slats to make your interior look more vibrant, lively and inviting. 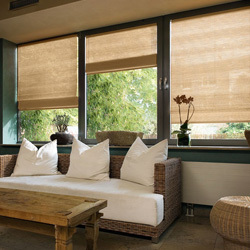 The Perforated Blinds are an ideal solution for those who want solar control as well as outside view. The tiny holes in the slats lets you view the outside when in closed position while blocking the glare of the Sun. 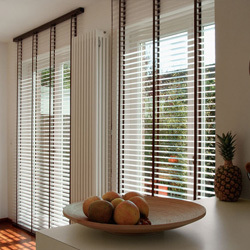 We have an exquisite collection of Wood Venetian Blinds. An innovation in quality and precision with a range of exotic colours. Made from the finest quality basswood in the state-of-the art machines at an ultra-modern plant. A precision machine finishes every single slat in uniform width, length and thickness for smooth and easy operation. A truly world-class range of wood blinds for those who value and appreciate quality and aesthetics. All wood blinds come with matching top valance. A choice of over 50 exotic colours and finishes. Choice of 25, 35, and 50 mm slat width in basswood. Choice of 28, 35 mm slat width in Teak wood. Choice of corded or woven ladder tapes. Made from finest seasoned bass wood. 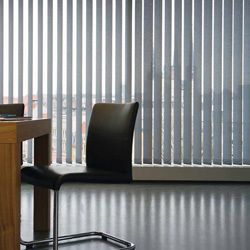 Vertical blinds are an ideal solar control solution with a wide variety of fabrics in purely decorative designs, prints and textures beside specialized fabrics like screen, solar, blackout and dim-out. The main attribute of specialized fabrics being effective solar control by lowering the inside temperature to a considerable extant, cutting out all glares and reflection. They provide a very soft and an even daylight for conducive working environment and even saves substantially on energy costs by making air-conditioning more effective. This window covering combines the personality of a roller shade with the soft look of a drapery. The Vertical Fabric Blind moves up and down instead of the traditional left to right movement of fabric curtains. 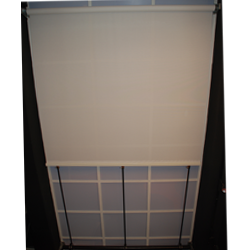 This fully imported motorized blind has options of blockouts, sheers and printed options. 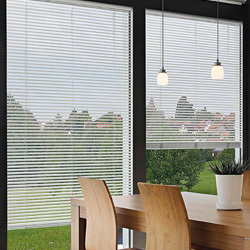 The Zebra blinds are similar to roller blinds except that there are two layers of fabric, one behind the other, having staggered strips on each panel. As you lower or raise the blind, the blind can be made opaque or sheer by aligning the strips. 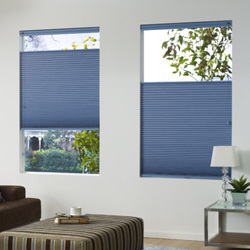 These shades are made from high quality polyester fabric that won't fray, are treated to resist stains and have an anti-static finish to minimize dust build-up. Just as the roller blind, they stack completely giving you a clear and unobstructed view. The Inter-Glass or Sandwich Glass Blinds are essentially slim venetian or honeycomb blinds enclosed with a double glass unit or a DGU. 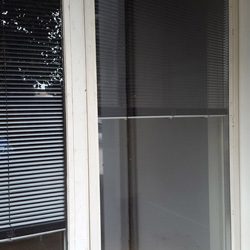 Since these blinds are enclosed within two toughened glasses and concealed, they are protected from external factors such as dust and dirt and will always remain clean. By virtue of being motorized, these blinds are protected from mechanical damages due to human intervention. 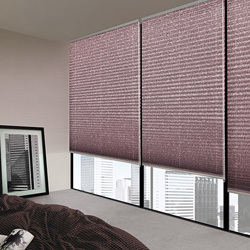 The venetian and honeycomb blinds are available in a range of colours and styles.